Home \ Software \ Retargeting 101 – How it works, what you do, and our results! Retargeting 101 – How it works, what you do, and our results! 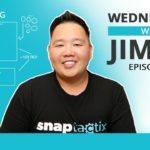 We’re back with Episode 18 of Wednesday’s with Jimmy! Today, we talk all about RETARGETING 101! Retargeting for Facebook and Google – how it works, how to do it, and real results! Subscribe to my channel – we drop new VLOG every Wednesday at 8AM EST -https://www.youtube.com/jimmykimlive?…. Subscribe and give this video a THUMBS UP if you enjoyed this video! Let me know in the comments below on your thoughts on this video! Creating Video Tutorials: What Will You Need?